A "Luge Team Relay" event? Do they hand off a baton at high speed on a banked curve? 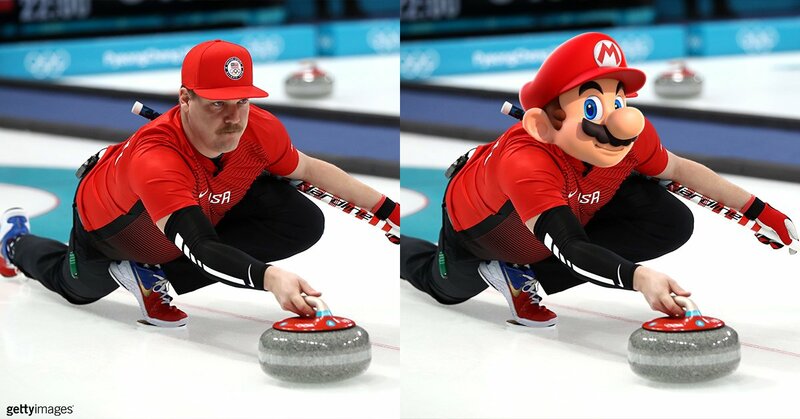 The Olympics might be more interesting than I thought. The team relay event made its Olympic debut at the 2014 Sochi Games. Each team, or nation, consists of three sleds: women’s singles, men’s singles and doubles. The competition starts with the women’s singles sled. At the finish, she hits an overhead touchpad, which opens the start gate for the men’s singles sled. Once he finishes and hits the overhead touchpad, the doubles sled makes the final run down the course. Wimps. It would be cooler if they started the next luge by smashing into it. Bastards. Just over half a second separating 1 through 5. When I was a baby sleeping in a Swiss hotel dresser drawer, Dad and an American friend he met there went skiing for the first time. The beginners slope looked too steep. So they did what any red-blooded American would do, they went off on their own. The nice easy slope they found was just what they were looking for until it became obvious they were skiing uncontrollably down a bobsled run. No Americans were badly injured, but I pooped myself, which made me smile. Misleading headline: "Snowboarder breaks neck in terrifying olympics crash"
Well, technically he did fracture a 5th vertebrae, but got up and finished his run. Lindsay Vonn: You call that a "terrifying crash?" Here, hold my beer. Not misleading at all. Did you watch the video? It made me cringe. No one with a broken arm would ever say that to someone with a broken neck. Opps, wrong wreck. Femur fractures can be deadly, too. ... My comment was actually more about respect for Lindsay than anything negative about the snowboarder. Pffft, she didn't finish her run. It wasn't him that wrote the headline, anyway. Terrifying to a lay TV viewer and terrifying in reality can be different things. The headline is still accurate. Skeleton riders are totally crazy. The name predicts the outcome. The announcers played it straight. She's like the George Plimpton of winter sports. Russia's participation in the Winter Olympics was affected by the aftermath of its state-sponsored doping program. As a result the International Olympic Committee suspended the Russian Olympic Committee. Russian athletes whitelisted by the IOC were allowed to compete neutrally in Pyeongchang, but they are not allowed to compete under the Russian flag. Trump was right, Russia doesn't medal. "If you're strong and have endurance, you can sweep longer and harder." Can curling doping lead to a PERM-anent ban? The Olympics is the only time when the phrase "Great execution by North Korea" seems okay. She's not good, and doesn't deserve to be in the Games. But she qualified under the rules set forth by the Olympic committee. They create bad rules, somebody follows them to their personal advantage, and we say she "gamed the system." Maybe we should say "Sloppy rule-making allows awful skier to pretend to "compete." I thought the halfpipe run was precious and she's quirky enough to be entertaining to me. WTH, if I could get into the Olympics with minimal skill and effort, I sure would. The headline is accurate, but I don't share the negative connotation that some would from it. But "gaming the system" does have a negative connotation, even if all definitions are not necessarily negative. What she did isn't different in principle from those who get there by building a team and then picking a country to be "from." Entertaining and heart-warming story though it may be, did the Jamaican bobsled team really belong there? Or shirtless Tongan "cross-country skier"? I would have preferred a story (and headline) that highlighted her effort and creativity to get to the Games, knowing she wasn't really in that league. Sign of the times, though - find something to bash. In a not very alternate universe, shuffleboard is an Olympic sport and curling is a kids game played on icy sidewalks and parking lots. I think I remember somebody here commenting that it would be fun to put a generic-average skill guy in each competition to show just how great the real competitors are. I guess we did that in womens' half-pipe and cross country skiing. Like we did with POTUS?